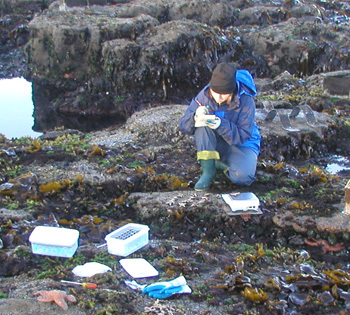 Monitoring of marine protected areas ranges from scuba surveys of fish to intertidal surveys of invertebrates and algae. Photos by Robert Schwemmer/NOAA (above) and PISCO (below). 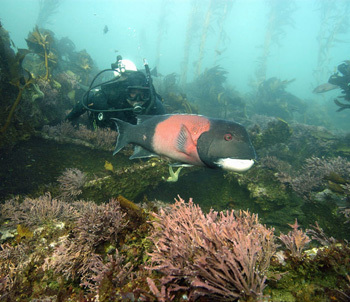 Studies conducted in California and elsewhere provide support for the use of marine reserves as a tool for managing fisheries and protecting marine habitats, according to biologists at the University of California, Santa Cruz. A recent study in the Gulf of California, for example, confirmed the validity of a key concept behind marine reserves--the idea that offspring produced in a protected area can replenish the stocks of harvested species outside the reserve. "It seems really obvious, but it had never been tested," said Peter Raimondi, professor and chair of ecology and evolutionary biology at UCSC and coauthor of a paper describing the findings in the journal PLoS ONE. "We created a model to predict the dispersal of larvae outside the reserves, and the results were completely consistent with our predictions," he said. Raimondi is involved in a collaborative project (called PANGAS) in which researchers are working with Mexican fishing communities to study and manage fisheries in the northern Gulf of California. Local fishermen in the area of Puerto Peñasco set up a network of marine reserves as part of a community-based effort to manage their resources. Ecological and social studies conducted before, during, and after the establishment of those reserves enabled the researchers to track the results. Raimondi emphasized that resource managers have a wide range of tools at their disposal and must take into account both biological and social factors in choosing the best approach. Many species, such as tuna and squid, move around too much to be protected by setting aside certain areas. For species that tend to stay put, marine protected areas can range from no-take reserves to various levels of limited harvesting, and sometimes involve restrictions on who can harvest fish in an area rather than how much can be taken. The establishment of marine protected areas along the California coast, as called for in the 1999 Marine Life Protection Act (MLPA), has been controversial. A network of protected areas was established on the Central Coast in 2006, and a plan for the North-Central Coast was adopted in August 2009. In Southern California, a task force will soon make recommendations to the state Fish and Game Commission, while on the North Coast the planning process is just getting started. Raimondi and Mark Carr, also a professor of ecology and evolutionary biology at UCSC, have been actively involved in this initiative. In addition to serving on science advisory teams, they are engaged in an intensive monitoring program to track the effects of the reserves that have already been established. "We are monitoring those areas at unprecedented levels. It's a comprehensive effort to characterize the populations and the ecosystems so that we can compare the responses to different types of protection," Carr said. "Monitoring studies around the globe systematically show positive responses within protected areas. We want to really identify what aspects of reserve design are important in influencing those benefits." According to Carr, it will take a few more years of monitoring to see the effects of the Central Coast reserves. In the Channel Islands, however, where reserves were established in 2003 (separately from the MLPA process), surveys have yielded the kinds of results scientists expect to see in protected areas. For example, fish species targeted by fishermen tend to be bigger and more plentiful within the reserves. This effect is important, because studies have shown that larger, older females are much more important than younger fish in maintaining healthy populations of species such as West Coast rockfish. "When you have a protected population, you not only get spillover effects when fish swim out of the reserve and get caught, you also have major effects on larval production," Carr said. "The bigger, older fish in the reserve produce a lot of larvae that replenish the fished populations outside." Carr, who contributed to a report on the first five years of monitoring in the Channel Islands, said that the conclusions are limited by a lack of data collected before the reserves were created. It is possible that some of the observed differences existed before the areas were protected, but such doubts will be erased if current population trends continue, he said. In Puerto Peñasco, the shellfish harvested by local fishermen grow and reproduce quickly. As a result, the fishermen saw beneficial effects within a year after they had established a network of reserves. Subsequent events, however, underscored the role of social factors in the success of fishery management efforts. A second paper, published in PLoS ONE in July, describes how, after its initial success, the local reserve system collapsed due to poaching by outsiders. "The whole thing got wiped out due to disruption of the social structure that had supported it," Raimondi said. "Scientifically it was really interesting, but for the people who experienced it on the ground, it was terrible." Richard Cudney-Bueno, a research associate at UCSC's Institute of Marine Sciences and cofounder of the PANGAS project, is the lead author of both papers. "Here was a group of fishermen that had already seen some declines in the shellfish they harvested. This led to the implementation of community-based efforts to manage their resources, including the establishment of marine reserves," he said. "We found that local control of community resources can work, but there has to be broader government support to back up the local efforts." A native of Mexico City, Cudney-Bueno has been working with Mexican fishing communities and conducting ecological and social research in the Gulf of California since the mid-1990s. He now has a joint position with UCSC, the University of Arizona, and the David and Lucile Packard Foundation. The first reserve in the Puerto Peñasco area was established in 2001 around an island. Cudney-Bueno and other researchers, working with a Mexican nonprofit organization (Centro Intercultural de Estudios de Desiertos y Océanos), trained the fishermen to monitor shellfish populations in and around the reserve. "The response was really quick, so they could see a classic reserve effect one year later," Cudney-Bueno said. "That led to more areas being closed, and the first paper shows the effects of the network of reserves." The cooperative was so successful it was recognized by the Mexican government with a Presidential Conservation Award. But word spread quickly along the coast about the thriving shellfish populations in Puerto Peñasco, and other fishermen from outside the community began to move in and poach from the reserves. After poaching began, the system of cooperation that had established and protected the reserves broke down. Now, the situation is beginning to improve again, Cudney-Bueno said. The Mexican government has created one of a handful of exclusive fishing zones in the Gulf of California, giving the local cooperative the exclusive legal right to harvest shellfish in the Puerto Peñasco area. "They now have a strong management plan with legal rights and government support, so I think they will be able to get back to where they were before the poaching started," Cudney-Bueno said. "I see it as part of the evolution of a management system. Social change takes time, and it really hasn't been that long. A lot is happening now in Mexico and around the world as local people are increasingly asking for control over their resources. Various fishing communities in Mexico, including lobster and abalone fishermen in Baja California, have moved forward with the establishment of their own marine reserves and government-backed forms of territorial-use rights." The PANGAS project, which brings together experts from UCSC, the University of Arizona, and several collaborating academic institutions and nonprofit organizations in Mexico, is working with other fishing communities in the Gulf of California to develop management plans for the region's marine resources. "PANGAS is now working with the Mexican government to build management plans for a series of species in the northern Gulf of California," Raimondi said. "It's interesting to compare that with the MLPA process in California. The approaches are very different, and it has to do with differences in government and social structures." According to Carr, the California MLPA process is now being used as a model in other parts of the world, most notably in the United Kingdom. Additional information about the MLPA process can be found on the California Department of Fish and Game web site. For more information about the PANGAS project in the Gulf of California, see the earlier press release.